Here egg whites are vigorously beaten to produce a soft foam then stiff white peaks that hold their shape. When you have whisked enough, you can even hold the bowl upside down and the mixture won't fall out. 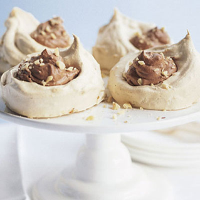 Unrefined brown sugar gives these meringues a lovely caramel flavour. Preheat the oven to 110°C, gas mark ½. Line a large baking sheet with baking parchment. Place the egg whites in a large clean mixing bowl and beat with an electric or balloon whisk until stiff peaks form. Add the sugar, a tablespoon at a time, until the mixture is thick and glossy. Gently fold in all but 2 tablespoons of the nuts. Spoon into 4 piles on the lined baking sheet and use the back of a spoon to make a small indentation in the centre of each for the filling. Place in the oven for 2 hours. Remove and allow to cool completely on the sheet. Place the chocolate in a small heatproof bowl set over a pan of barely simmering water - ensuring the bowl doesn't touch the water - for 3 minutes or until smooth and melted. Set aside for 10 minutes or until cool but still liquid. Pour the cream and Kahlúa into a large mixing bowl and whisk until soft peaks form. Gently fold in the cooled chocolate. Transfer the meringues to 4 serving plates and top with the chocolate cream. Sprinkle the remaining nuts on top and serve. For best results when beating the egg whites, use a bowl with no traces of grease. You can substitute the Kahlúa with Baileys or Tia Maria, if you prefer. This recipe was first published in March 2006.